For over two years now, I've been pondering what I reealllly want for a graduation present. I never asked my parents for a major graduation present after WLC because I really couldn't think of anything I wanted that much. I've been bouncing the question around in the back of my mind for the last two years, but I had no more real wishes for a grad present. Not until tonight, anyway. About half an hour ago, I went straight downstairs and said to my mom, "I know what I want for a graduation present. 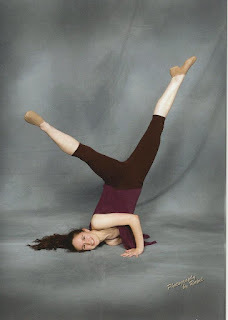 Wherever I wind up teaching, I want a membership to a local dance studio." One thing I've learned from doing my Travel Blog is that when you have some kind of adventure, it's important to take some time and think about what you learned from it. It's a way to put the memories in your long-term recollection, but also to associate it with what was most important and what you gained from it. I didn't just have an adventure so much as an experience, but I think it was almost as important as anything in my Travel Blog, so I'm reflecting on it now. I don't think it's been a secret that I've been under a lot of stress with my Washington teaching certificate (despite the fact that I'm about 100% determined to find a teaching job somewhere other than this state, and therefore about 95% sure that it will happen), and I haven't been dealing with the stress very well. I actually may have lost weight due to stress, which, if you've seen me, you know I can't afford. Now, my problem is that I didn't really have a lot of coping mechanisms. Writing was never a coping mechanism for me - oh no, that was always its own adventure. I've heard that, generally speaking, exercise is a good coping mechanism, so I started taking walks around my block, that just kept getting longer and longer without actually helping me at all. I tried listening to different music. YouTube has all kinds of options for de-stressing music (some of which apparently cleanses your cells - who knew?! ), so I tried listening to that. I tried listening to some of my old favorites that I used to find comforting. I tried getting extra, extra sleep. None of it really helped - in fact, my coping mechanisms turned into escape hatches, where I would run from the problems causing my stress rather than face them head-on. Today, I remembered out of the blue a quote from Martin Luther on one of my desk calendars that the more work he had to do, the more he would begin praying. So I thought, okay, let's try what I definitely should have tried first. I'll say a prayer. So I shut off all the lights in my room, got down on my knees next to my bed, and tried to spend some time in prayer. As I was praying, I remembered that this wasn't the first time I had been under a lot of stress (or the worst, frankly) - it was waaaaay worse when I was working on my various thesis projects two years ago, my senior year of college. And during that time, a thought had occurred to me that I really couldn't act on back then: I never had this kind of stress when I was in dance. Had dance been my way of dealing with stress before I ever realized it? I wasn't sure back then, but this time I decided to test my theory out. I went out to the living room, put on a song, and tried some of the old stretches that I remember best. In the space of one song, stress was reduced; three songs through, I felt calm and ready to tackle my project again. Strong, even. I'm not especially surprised, and I'm annoyed at myself for not thinking of this sooner. If you've ever gotten me on the subject of dance, I've probably mentioned how healthy and important it is. Music, discipline, exercise, and the feeling of accomplishing a small task are all considered highly important for mental and emotional well-being, and dance tackles all of that in one. It got me back on task, and it settled my stress and anxiety to vastly more measurable levels. I quit dancing after high school because I was diagnosed with Freiberg's Infraction, which can't be cured and which causes varying degrees of pain in my right foot. Sometimes it could get pretty bad. But I think the pain in my foot is far more manageable than the stress in my mind, so when I get the chance, I'm getting back on the dance floor.